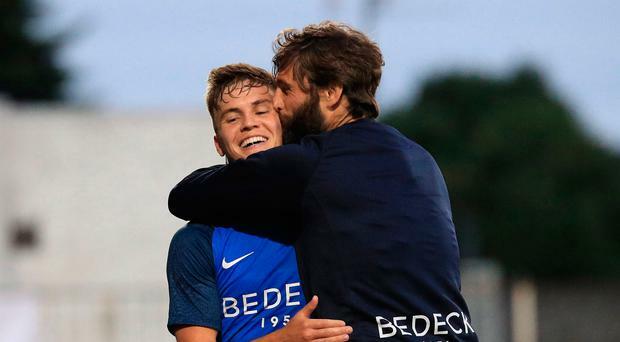 Glenavon are the toast for the Irish League after recording a stunning 2-1 victory over Molde FK in the first-leg of their Europa League first round qualifier. Gary Hamilton's understrength side stunned the Norwegian visitors, managed by Manchester United legend Ole Gunnar Solskjaer, and they even came from a goal down to secure a slender advantage in the tie. Crusaders lost 7-0 to Bulgarian champions Ludogorets in their Champions league qualifier, but the night's heroics came at Mourneview Park where Rhys Marshall and Josh Daniels scored in either half after Eirik Hestad had given the Norwegian visitors the lead. The Lurgan Blues will travel to Molde for the return leg on July 19. Molde's Fredrik Aursnes missed a late penalty to equalise, allowing the Lurgan side to celebrate a memorable win. Cliftonville host Danish side Nordsjælland tonight in their Europa League qualifier while Coleraine are away to away to Spartak Subotica. Derry City will tackle Dinamo Minsk at the Brandywell.